In this Expert Series Webinar, Alison Sim focuses on how to effectively communicate and motivate your patients. Understand the use of Cognitive Behavioural Therapy (CBT) and Acceptance and Commitment Therapy (ACT) approaches in order to properly integrate them in your own practice and to help and guide your patients. 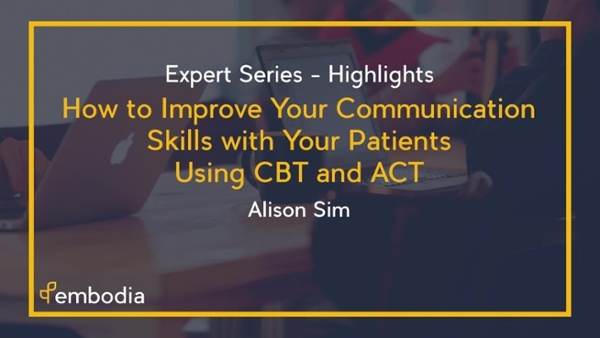 Watch the webinar highlights to hear Alison Sim's thoughts on how to improve your communication skills with your patients. Dr. Alison Sim trained as an osteopath in Australia and has completed a Masters degree in pain management. She has been speaking on the topic of pain science and the integration of this knowledge into clinical practice for several years. She is a firm believer that a good understanding of integrated pain science knowledge is powerful for both clinicians and patients, and that manual therapists are among the best placed practitioners to be implementing such approaches in the healthcare setting. Learn more from Alison Sim's online course now!